Prepared, ready to go, a member of RIOC's crew sets up for work on graffiti removal at The Prow. Under a hot July sun, a RIOC crew began the chemical process of removing years of accumulated graffiti from The Prow, an art installation with once-higher ambitions that's been a subject of neglect numerous times in the past. This time, however, RIOC incorporates a plan to make removal easier in the future. After we witnessed the work about to get underway, yesterday at mid-morning, we asked RIOC about it. How long will this take? What's the process? 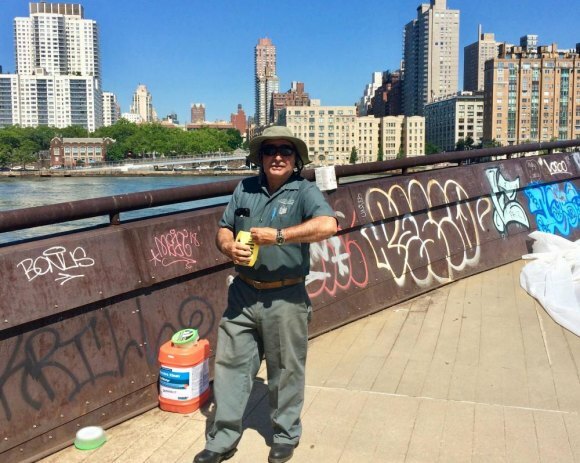 Graffiti removal at The Prow, the metal *dingy-like boat structure that juts out into the East River near Octagon Park has begun. RIOC crews are using Prosoco-brand paint remover which is environmental friendly and works well on metal. After application, the product “cures” for up to an hour, before the surface is brushed and then power-washed with regular water. This step may have to be repeated several times to remove some of the Prow’s toughest graffiti spots. Once the surface is free of graffiti, RIOC grounds crews will apply a wax-based product as a protective layer to make any new graffiti easier to remove just a power washer as the layer of wax (and the new graffiti will “melt” away. A new layer of wax is then reapplied. The work on the Prow and other graffiti-defaced areas around the Island is expected to continue through September. *Let's assume that RIOC Public Information Officer Alonza Robertson meant "dinghy," which actually is a boat, not "dingy," which means gloomy and drab. It's an error, in either case, since a dingy is a "a small boat for recreation or racing," which The Prow clearly does not represent. In any event, we're delighted to see the work finally begun. We'll keep you posted.